Of all the colours in the rainbow, which catches our attention first? RED, of course! It’s not by accident that stoplights, fire engines and mailboxes are all painted red. And what orchids first attract our attention when we scan the show benches from across the hall? There’s a fair chance that Sophronitis coccinea, Masdevallia veitchiana or Disa uniflora, which all have bright red or bright orange flowers, will be among them. A more recent addition to this list of old favourites with red flowers is Phragmipedium besseae. This spectacular red-flowered South American species has revitalised interest in growing phragmipedium species and their hybrids since its discovery in 1981. 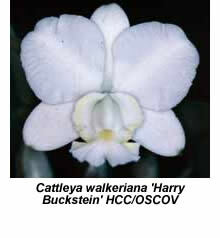 Mrs. Elizabeth Besse, a member of an orchid collecting party from the Selby Botanic Gardens ( Florida), was the first to find this species in the wild. Apparently she found it by accident while answering a call of nature! It was growing in semi-shade on wet granite rocks at an altitude of 1100 m in Peru. 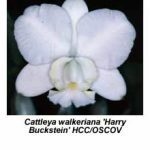 Subsequently other colonies of the species were found further north in Ecuador, again growing on wet granite rocks at altitudes of 1000-1200 m. It remains a mystery why such an eye-catching species was not discovered earlier, for orchid collectors had been traversing its mountainous habitat for over a century. Apparently it is never found in large numbers but the brilliant red colour of its flowers would certainly make it difficult to miss. Presumably earlier collectors passed by when it was out of flower. Blue flowers may not catch our eye as rapidly as red ones but they are certainly more unusual, as there are fewer blue flowers in the orchid kingdom than of any other colour (except black!). 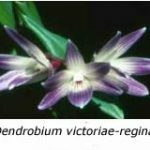 Australia has more blue-flowered orchid species than any other continent, most of them belonging to the genus Thelymitra, although not all thelymitras have blue flowers. They are commonly called sun orchids, because their flowers open only on warm, sunny days. This behaviour accounts (in part) for the almost total absence of thelymitras from our show benches. Other reasons are that they’re difficult to acquire (legally) and in general are harder to maintain in cultivation than other Australian terrestrial genera such as Pterostylis and Diuris, commonly known as greenhoods and donkey orchids, respectively. The blue-flowered species most commonly seen in the wild in Victoria are Thelymitra aristata, T. ixioides, T. nuda and T. pauciflora, the last being the most common, and also the least spectacular. 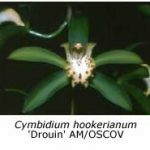 The easiest way to see them in flower is to visit the Australasian Native Orchid Society show, which is usually held on last weekend in September at the Mt. Waverley Community Centre in Mount Waverley each year. Yes, you will see the flowers, because the plants are customarily displayed beneath a bank of sunlamps! The Australian genus Caladenia also has a number of blue-flowered species, C. deformis and C. caerulea being the most common in Victoria, while Western Australia has several spectacular species (C. gemmata and C. sericea). These species have been assigned new names in recent years but you will need the old names if you hope to find them in older texts. South Africa also has a number of blue-flowered orchids. 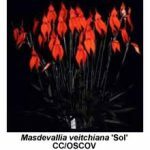 We all know that Disa uniflora has red or orange flowers but the genus Disa has over 130 species with flowers in almost every colour of the rainbow. At least two (Disa maculata and D. longicornu) have blue flowers while the related genus Herschelia also has several blue-flowered species, including H. graminifolia. The only blue-flowered species that I can recall on our show benches in Victoria are Dendrobium victoriae-reginae,Vanda coerulea and (rarely) Aganisia cyanea (syn. Acacallis cyanea). Some orchid species have predominantly green flowers. What advantage would such orchid species have over others with more colourful flowers? One would imagine that green flowers would be at a disadvantage, being harder for pollinators to find than flowers whose colour contrasted with that of the foliage. Of course, perfume is just as important as colour (or even more so) in attracting pollinators, and it is no coincidence that all of the green-flowered species mentioned below are perfumed. One example is Lycaste locusta (recently renamed Ida locusta), which is apparently still abundant along railway embankments in the mountains of Peru. 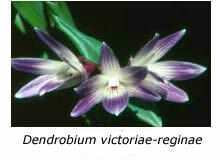 Although its pseudo-bulbs are hidden under grasses, its leaves and flowers are usually exposed to full sunshine. Another is Aeranthes ramosa, which has flowers of a deeper green than any other orchid known to me. This species, a native of Madagascar, is one of about forty in the genus Aeranthes. The flowers are produced singly but successively on a long, wiry, pendulous inflorescence that can reach a metre in length, so that the flower sways in the slightest breeze. 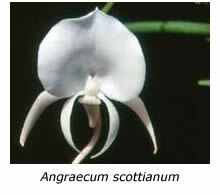 The flowers have a long spur, like those of other angraecoid orchids, and are pollinated by moths during their search for the nectar that collects at the end of the hollow spur. Cymbidium hookerianum (syn. C. grandiflorum), a species from northern India and China, has apple green flowers (the lip is cream/yellow). Unlike the above species, it grows and flowers under shade-house conditions in Melbourne. The large flowers (up to 140 mm across) are attractively displayed on a pendulous inflorescence. The genus Liparis comprises about 250 species, a few of them native to Australia. Others are found around the globe, from North America through Africa to Asia. Most have yellow, purplish or occasionally red flowers but the Asian species Liparis viridiflora carries dozens of tiny green flowers on a pendent inflorescence. Finally, there is the mainly Australian genus Pterostylis, which consists of over sixty species, most of them producing flowers that are predominantly green in colour. The dorsal sepal and petals form a hood, giving rise to the common name of greenhoods for these widespread Australian native orchids. The species most commonly seen in Victoria is Pterostylis nutans – its flowers are entirely green. Greenhood orchids do not seem to be perfumed to us but I’ve read that they exude a slight musty odour that attracts the fungus gnats responsible for their pollination. Finally I describe a few of those orchid species that produce white flowers. A good place to begin is with an orchid commonly called ‘the ghost orchid’. Known botanically as Polyrrhiza lindenii, it has recently acquired notoriety because of Susan Orlean’s book, The Orchid Thief, in which she describes its illegal removal from its home in the swamps of Florida’s Everglades. The flower of this leafless orchid has a white labellum that resembles a white frog in mid-leap! This unusual species has recently been propagated from seed and by tissue culture, and is now being successfully grown in cultivation in USA. The angraecoid orchids of Madagascar and the Comoro Islands probably comprise the largest group of white-flowered species in the orchid kingdom. 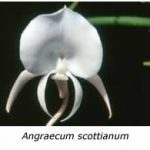 Perhaps the most well known is Angraecum sesquipedale (the comet orchid) but there are many other species with white flowers among the genera Angraecum, Jumellea, Aeranthes and Aerangis. 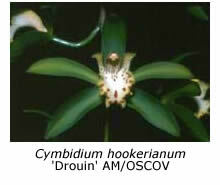 All these orchids rely predominantly on perfume to attract the night-flying moths responsible for their pollination. The white colour of the flowers merely acts as a visual attractant when the moths are sufficiently close to see and are perhaps confused by the overwhelming perfume at close range. Among the masdevallias, the most well known white-flowered species is undoubtedly Masdevallia tovarensis, which carries up to five long-lasting brilliant white flowers on each inflorescence. The flower stem should not be removed when the flowers fall, because it is capable of producing more flowers during the following season. The most famous of all white-flowered orchids is undoubtedly the Asian species Phalaenopsis amabilis, as it is in the parentage of the millions of white phalaenopsis hybrids that are sold throughout the world each year. Other Asian species with white flowers include Dendrobium infundibulum, D. formosum and D. schuetzii. The flowers of all seven species mentioned immediately above are entirely or predominantly white but there are many other species with coloured flowers that have white forms or varieties. For example, various forms of Masdevallia coccinea produce flowers that are red (the type form), cerise, magenta, pink, yellow or white. Many cattleya species have pink or mauve flowers but white-flowered forms of these same species are known and find great favour with both growers and hybridisers. Cattleya intermedia, C. walkeriana and C. warscewicziana are just three cattleya species with desirable white (alba) varieties. They are just a few of a host of species or varieties with white flowers. The biggest disadvantage of white flowers from the viewpoint of the show-bench exhibitor is their tendency to develop brown fungal spots under humid conditions. I do not know whether white flowers are more prone to spot than coloured flowers or whether the spots are merely more obvious on the white flowers. Whatever the cause, I advise you to move orchids with white flowers from the shade-house or glasshouse to a drier environment as soon as the flowers are fully open.